Winco GBS-3 Stainless Steel Gravy Boat 3 oz. Serve sauces and gravy on individual trays and platters in the Winco GBS-3 Stainless Steel Gravy Boat 3 oz. This attractive and durable gravy boat can hold 3 oz. portions so each customer can have their own gravy boat filled with their choice of salad dressing and other condiments. 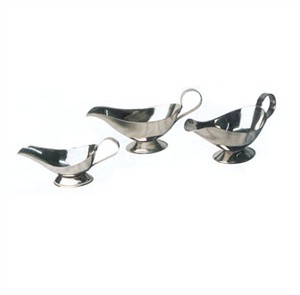 Made of durable stainless steel, this gravy boat will add a festive air to your dining table. Winco GBS-8 Stainless Steel Gravy Boat 8 oz. Winco GBS-5 Stainless Steel Gravy Boat 5 oz.